Can Business Continuity Survive Without IT? 80% of IT professionals say the loss of digital assets would be more damaging than the loss of buildings, vehicles, or other goods. 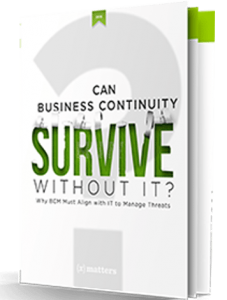 That’s why it is crucial for business continuity teams to align with IT to ensure business resilience. Grab this whitepaper and learn how to utilize targeted communications to help secure your digital assets, manage threats, and resolve incidents quickly and efficiently.